Being a writer is more than just a profession. It’s a special kind of bizarre. Check for these 52 tell-tale signs of being a writer. In July last year, I shared with you 54 ominous signs that you might be a writer. Writers are “special” people. I offered that guide to help you self-screen for this condition before it becomes terminal. Now I offer you another 52 signs you can use to self-diagnose your condition. I strongly urge you to read that guide first, before proceeding with this one, for no particular reason. Please feel free to let us know in the comments below if any of these signs apply to you. CAUTION: 4 out of 5 writers who read to the end of this guide have found their writer condition to be terminal. If you know the difference between homonyms and pseudonyms (and don’t wonder if one of them is illegal in some states), you might be a writer. If you ask Santa for a new Thesaurus, you might be a writer. If your favorite animal is a bee, because it can spell, you might be a writer. If you like to call them “smashed” potatoes because “smashed” has one more letter than “mashed”, you might be a writer. If you want to petition the government to make miming illegal, you might be a writer. If the phrase “Sticks and stones will break my bones, but words will never hurt me” actually does hurt you, you might be a writer. If you expect librarians to be paid more than mere accountants, lawyers and doctors, you might be a writer. If there is always room for “just one more” book, you might be a writer. 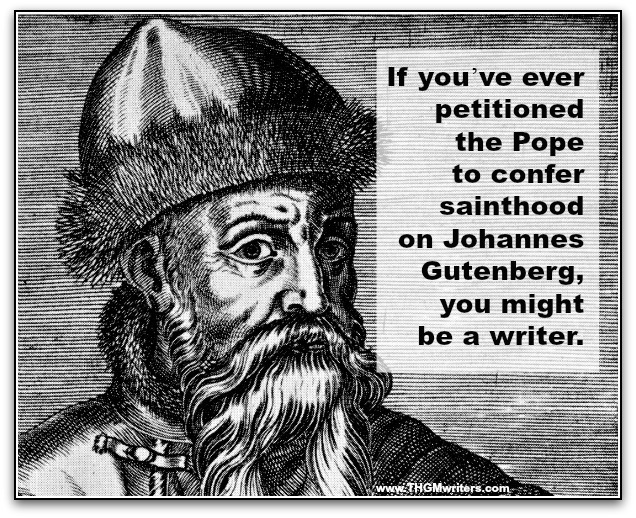 If you’ve ever petitioned the Pope to confer sainthood upon Johannes Gutenberg, you might be a writer. If you mispronounce words because you’ve only ever read them, you might be a writer. If you cringe at double negatives, you might be a writer. If you consider dreams to be missives from your muse, you might be a writer. If you dwell on how the nervous lady across from you on the bus would make the perfect murder victim in your next novel, you might be a writer. If you sort the clothes hanging in your closet to try to create a storyline with the tags, you might be a writer. If you calculate that a word is actually worth a thousand pictures, you might be a writer. If you find writing a research proposal more exciting than doing the research, you might be a writer. If you worry that the more people text, the less they write, you might be a writer. If you’ve always suspected that the tiny writing space on postcards was a nefarious government plot to limit your freedom of speech, you might be a writer. If the electricity goes out and you panic because you won’t be able to read in the dark, you might be a writer. If your dog brings you a writing pad instead of your slippers, you might be a writer. If you steadfastly refuse to reveal what’s in the dictionary , saying “Ah, spoilers…”, you might be a writer (or you might be River Song). If you think the best thing ever to come out of government is the CIA’s Style Manual and Writer’s Guide, you might be a writer. If your password recovery question is “What’s your favorite letter?”, you might be a writer. If your favorite scent is the smell of fresh paper, you might be a writer. If you think the best thing about the Bible is that it’s a book, you might be a writer. 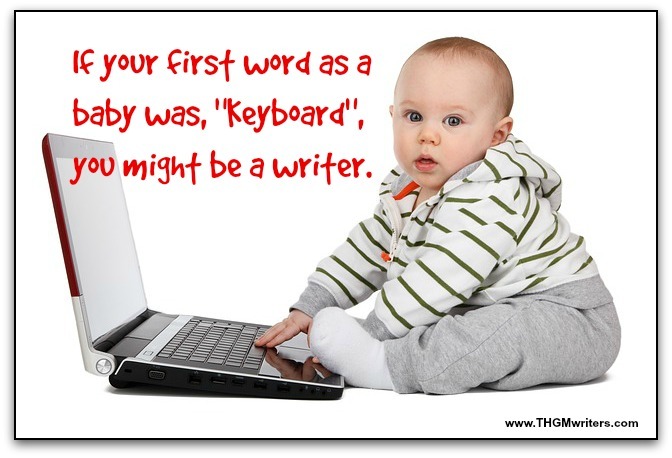 If your first word as a baby was, “Keyboard”, you might be a writer. If your daughter asks for a pet and you give her a Scrabble game, you might be a writer. If you refer to April Fools Day pranks “scheduled plot twists”, you might be a writer. If Michael Jackson’s “A B C” runs through your head at the most inexplicable times, you might be a writer. If your ideal vacation is a world tour of the greatest libraries, you might be a writer. If you always carry a dozen backup pens with you, you might be a writer. If sexting is your biggest turn-on, you might be a writer. If someone yells “Fire!! !” in a crowded movie theatre, and you pull out a copy of Dante’s Inferno, you might be a writer. If the world of The Matrix horrifies you because the movie has not been novelized, you might be a writer. If you describe yourself as a “huge fan of the word ‘defenestration'”, you might be a writer. If you can think of only one use for the back of a napkin (you know what that is, right? ), you might be a writer. If the flowers in your garden are hard to view behind all the cute little signs, you might be a writer. If you use letters to write out numbers like 3,872,496, you might be a writer. If the moving company charges you $500 extra because of all the “small heavy boxes”, you might be a writer. 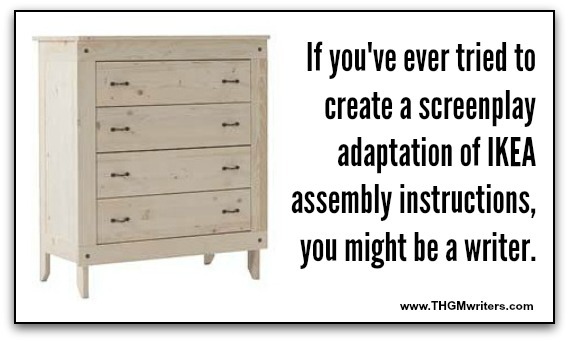 If you’ve ever tried to create a screenplay adaptation of IKEA assembly instructions, you might be a writer. If you’ve been training your pet szhitzu to follow commends like “Read!” and “Turn page!”, you might be a writer. If you have ever set up a fan site for your favorite punctuation mark, you might be a writer. If you measure time in chapters instead of years, you might be a writer. If you are never at a loss for words, you might be a writer. If you are constantly itching to add thought bubbles to photographs, you might be a writer. If you would rather send an email than talk on the phone, you might be a writer. If your tattoos are mostly on your hands and all accidental, you might be a writer. If your main beef with the English language is that it has too few letters, you might be a writer. If you can write Google Plus only as “Google Plus”, and never as “G+”, you might be a writer. If you love freshly fallen snow because it reminds you of a blank sheet of paper, you might be a writer. If you cringe at the moniker “Mal Loup” in Aliens of London because it is a poor translation of Bad Wolf, you might be both a writer and a Doctor Who fan (please seek immediate medical attention). This first one itself is hilarious! indeed! and to do a cross check or cross examination with us! You are indeed a wonderful and prolific writer Boss! Thank you so much for sharing this thought provoking yet wondrous points! David you are really rocking here! I still haven’t decided if writing is a blessing or a curse. I guess it depends on how well (correct use of good) the writing is going. I will share this resource with our online writing group.